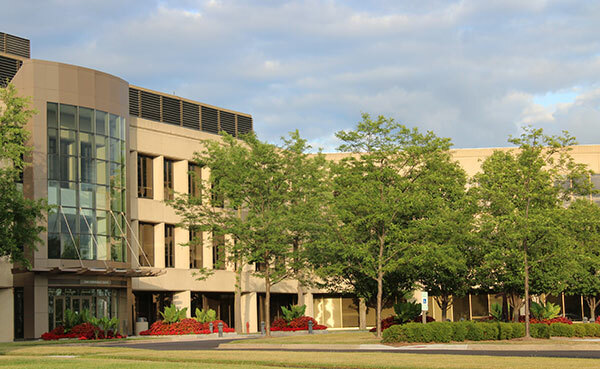 The Kemper Lakes Business Center is a multitenant corporate campus surrounded by 150 acres of grounds, all of which are managed by Balanced Environments. The company took over the landscape contract for the property in 2017, when a new management company took over the campus. “Irrigation on this site is crazy,” says Gayle Kruckenburg, senior account representative for Balanced Environments. So crazy, in fact, that the irrigation superintendent, Spencer Roberts, visits the site once a week, which is unusual, according to Kruckenburg. The irrigation system provides water for more than 90 percent of the primary turf areas. It includes 4-inch main lines and 91 zones controlled with five Weathermatic smart controllers. The property possesses changing water tables and soil types. The irrigation system is fed by a series of lakes that surround the property. Algae and other debris can clog nozzles, some of which need to be changed on a monthly basis. Balanced Environments recently separated zones for flower and turf requirements and relocated and removed heads as landscape changes were made. Each year, the system is winterized, a process that occurs over the course of two months. 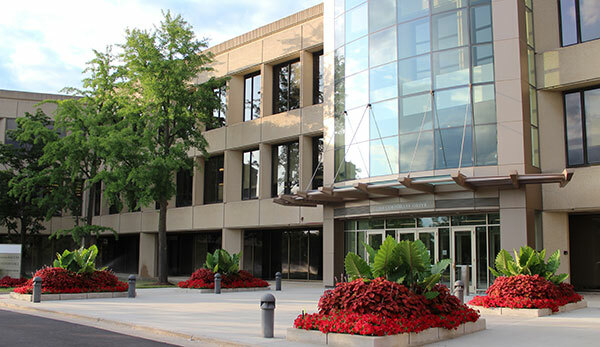 Kemper Lakes Business Center in Lake Zurich, Ill., is a 150-acre office campus with four interconnected buildings constructed in several phases between 1971 and 1991. The surrounding campus landscape has evolved to support hundreds of large landscape trees, with a blend of legacy native trees and planted shade trees, evergreens and flowering ornamentals, set against large expanses of manicured turf. The central campus is surrounded by large parking lots, providing 4,000-plus parking spaces for a daily workforce of nearly 4,000 people. The lots contain dozens of manicured landscape islands and several large pedestrian corridors, fully planted trees, formal shrub hedges and mixed flowering perennial and groundcover layers. These corridor areas are maintained for detail because they present close engagement with pedestrians on a daily basis. Campus entries and ring roads allow varying landscape experiences for the daily commuting workforce. Wayfaring guidance for all visitors is important on the large campus. Seasonal color plantings at all critical signage provides a cohesive, focal-point pattern through the landscape. A series of three complete, seasonal color rotations maintains focus at these important primary and secondary route intersections. A mix of flowering shrubs, evergreens and perennials are maintained to provide framing and separation of parking lot areas. Large, open turf areas are maintained weekly, with an emphasis on season-specific fertilizer and pest control applications and critical irrigation management. 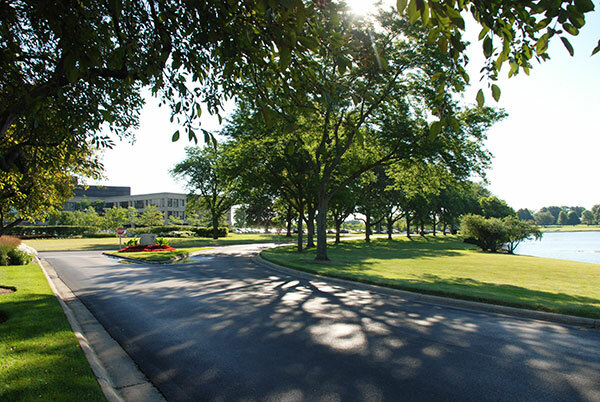 The business campus is surrounded on three sides by a large connected chain of lakes, shared with a world-class, PGA-rated golf course. Critical views are maintained and framed with landscape elements, both out from the campus and back from the golf course to share the landscape horizons of each. The campus landscape irrigation system is supplied by the lakes, which makes management of water quality critical for both lake and landscape. 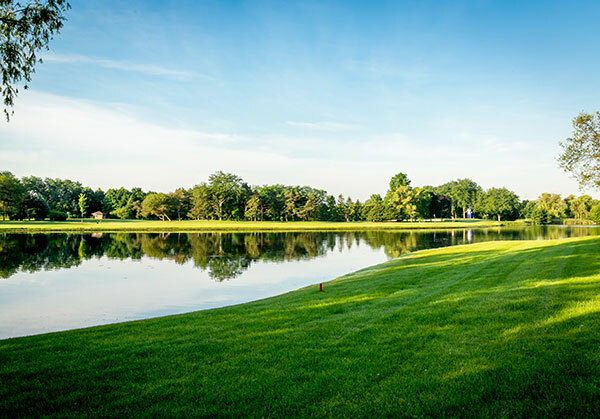 Schedules for irrigation use are strictly managed to minimize surface runoff and potential nutrient overload, and tight control on timing of turf applications, as well as periodic shoreline cleanup work, help to keep the lakes clean. Entry drives contain large, mixed ornamental plantings. Seasonal color borders are added to enhance the vibrancy of color, while the perennial grasses and ornamental trees ebb and flow with flowering effects. Turf border management is a challenge due to winter snow removal and salt use on the roadways. Specific applications of gypsum and early season fertilizer promote the lush green color of the early summer turf. Large areas of turf, in several border locations, previously managed on a weekly basis, have been strategically removed from this cycle, allowing property ownership more control on management costs for the campus. These areas, returned to “meadow conditions,” are continually monitored and managed to control invasive weed growth, but at a reduced cost burden. 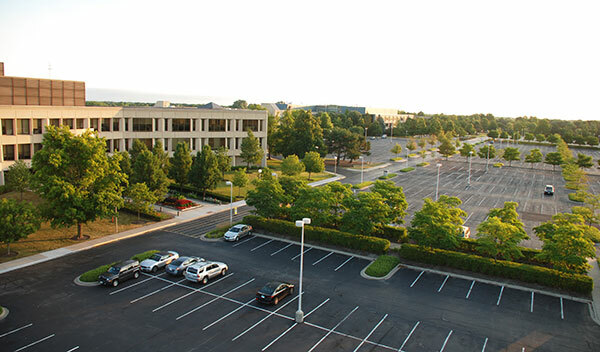 Four large interconnected buildings, providing 1.1 million square feet of office space, currently at a 97 percent occupancy, include several main building entry plazas. Each of the plazas are opportunities for impressive landscape statements to greet global visitors, as well as the daily workforce, for the three world-headquartered corporations on site. This gives importance for the landscape to perform. Each of the entry plazas are maintained on a daily schedule, including early morning cleanup prior to business openings. 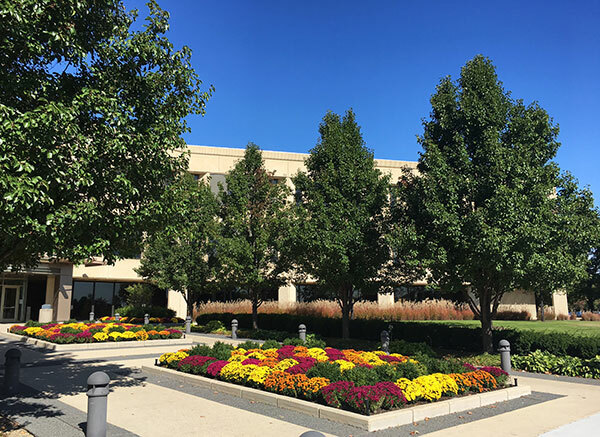 Seasonal color plantings are coordinated for a cohesive, campuswide setting, yet given unique treatments within individual plazas. Landscape plantings are maintained to enhance the designs, keeping bosks of planted trees and formal hedges consistent, with periodic pruning operations and specific fertilizer and pest control regimens. All building entry plazas receive daily cleanup prior to opening business hours to ensure pavement and planting areas are presented cleanly and safely. Seasonal color displays are hand pruned to maintain quality foliage and flower effects. Periodic fertilizer applications and tight control on the irrigation, integrated into each of the planting beds, keep the mixture of plantings vibrant and full. Large specimen trees are actively maintained with periodic pruning to reduce conflicts with the building facades. Tree health is closely monitored through arborist-directed, plant health care programs, including fertilizer applications and pest and disease control. 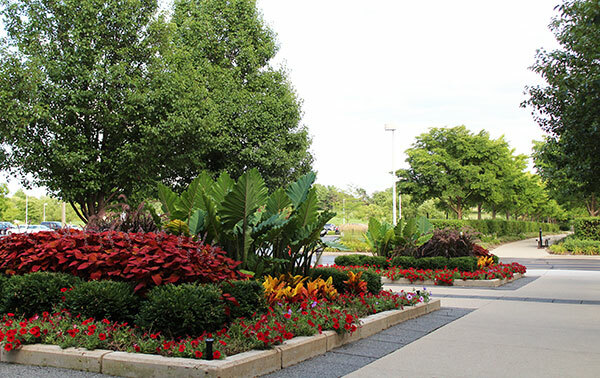 Unique and showy seasonal color plantings are a signature statement for this large corporate campus. A succession of three full-color planting rotations are coordinated through the landscape season and capped off with an ambitious winter décor presentation. The seasonal plantings aim to present show-stopping color, vibrancy and scale. Planting is executed with a mix of annual flowers, framed with groupings of perennial shrubs and evergreens, to present both spectacular color and size, as well as exciting textures and patterns. Emphasis on multilayered floral selections keeps the interest high from every perspective. Irrigation is strictly controlled to respond to changing conditions from spring through fall and with each seasonal planting change. 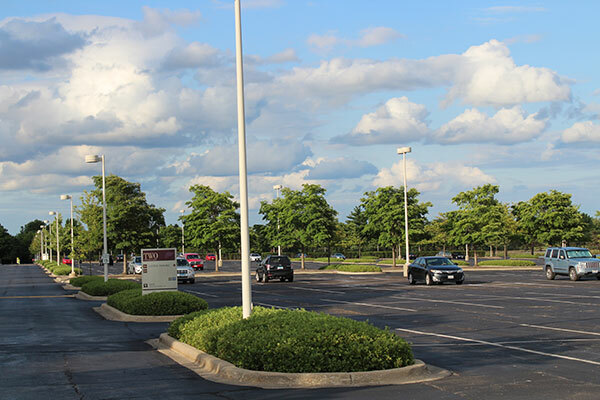 The large, expansive parking lot areas present a challenge for the landscape management team, in regards to the climatic effects of heat and drought stress on the landscape plantings. The site’s irrigation system does not extend coverage to the islands or outer border areas. Even so, the system does have more than 100 strategically located quick-coupler valve connections to allow crews convenient hose-watering opportunities for extreme conditions and general watering maintenance. The irrigation technicians service the system throughout the full season, including spring system startup and adjustments, winter shutdown and blowout, plus continual monitoring and scheduling adjustments to respond to changing site conditions. 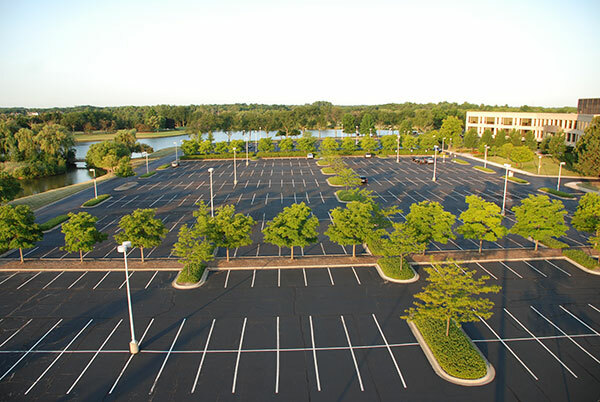 An originally designed landscape monoculture presents itself with the extensive parking lot island layout. Several dozens of small planting islands are fully planted with groundcover “Gro-low” sumac and groupings of shade trees. The extreme heat and dryness that the “sea of asphalt and concrete” reflects is hard on the plantings, and challenges the crew to keep the desired consistency of character. Critical to this are continual care operations including pruning, fertilizer applications and supplemental watering, along with diligent monitoring and scouting for pest and disease problems. Scouting is extremely important with a monoculture arrangement, as a small problem left unattended can quickly spread to damage large areas in a short time. There are multiple corporate office entries that present opportunities, as well as challenges. Each entry has a unique, individual character to distinguish the particular tenant, yet property management prefers to have a cohesive landscape presentation maintained for overall campus character. Seasonal plantings create the focal point detail at each entry. The specific plant varieties are kept consistent through repeating patterns across the campus. Foundation shrub plantings are maintained in several layers, carefully pruned on a seasonal basis to present separate levels of landscape color and texture, leading down to mixed groundcovers in the front borders. A large, upper-level amenity deck provides tenants with an opportunity to gather outdoors during pleasant weather. 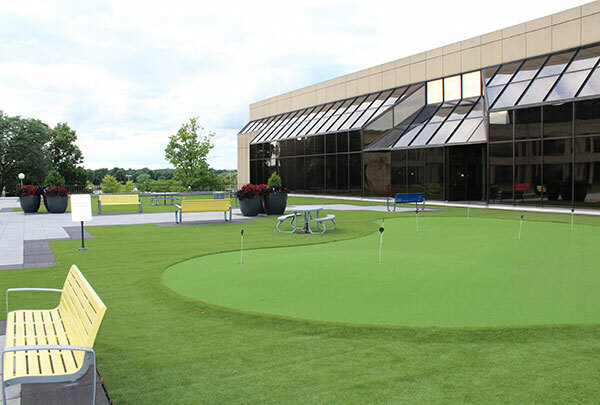 The company’s landscape maintenance crew is tasked with daily monitoring and cleanup operations to maintain several thousand square feet of artificial turf and concrete paving. Keeping debris from accumulating is important to maintain a pleasant, usable space. Seasonal color planters provide character and color consistent with other plantings on the site. Automatic irrigation is not available for these planters, so daily monitoring for adequate water helps keep them full and vibrant. Hundreds of large canopy trees and select large evergreen groupings provide an overall character of maturity and health on the campus grounds. The in-house tree care division is led by a licensed, certified arborist and provides a full array of seasonal tree care operations. Canopy pruning, species specific fertilizer applications, both foliar and soil-drench, and insect and disease plant health care monitoring is performed by crews. Specific preventive applications are scheduled throughout the season, and curative applications are performed as needed. Periodic tree ring improvements with detail edging, soil cultivation and mulching maintain the desired aesthetic appeal. Contrasting with the highly designed and manicured landscape details are several large border plantings of large, native sumac that provide strategic view screening to and from the campus and golf course areas. The landscape management crews will periodically work through alternating sections of these plantings to do rejuvenating pruning operations and to control invasive weed spread. Late-season dormant pruning practices allow a desired flush of new healthy growth to form at the lower levels within the borders. This maintains overall plant vitality and provides the strategic screening of select views. 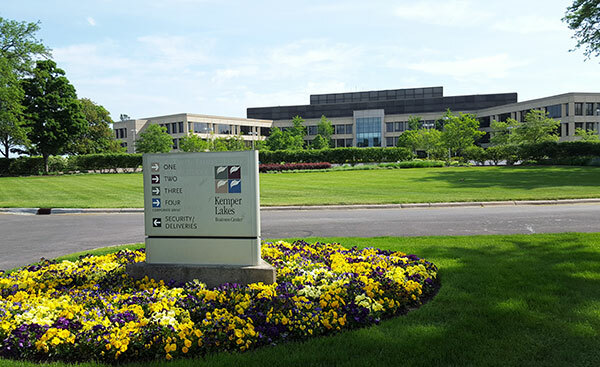 Other unique challenges will occur on this corporate campus due to its connection with a world-class, PGA-rated golf course. At certain schedules, campus facilities will be utilized for major golf tournament events, which will restrict the crews’ access to many campus landscape areas, as well as to typically available storage and equipment staging facilities. 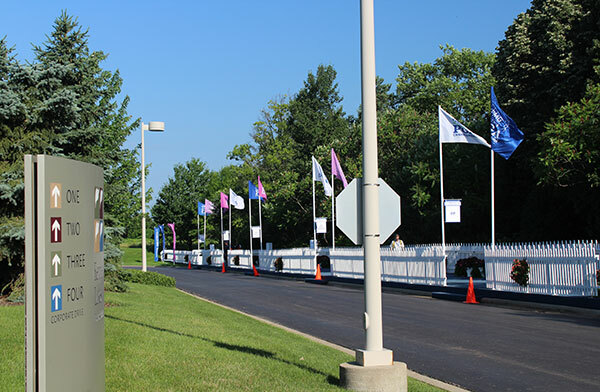 For weeks at a time, pressure is put on the crews before, during and after such events to ensure that the corporate campus landscape presents a quality character. Our operations need to be mobilized and reactive, as the facilities are locked out and traffic levels become extremely heavy during the event schedules. When the events are past, many landscape areas that have been heavily used require special attention for cleanup and renovation operations. The course of seasonal change, throughout this large campus landscape, is met by the management teams with enthusiasm and attention to detail. Seasonal color displays are managed through three complete rotations along with an extensive winter display. Each seasonal change is an opportunity to provide characteristic vibrancy and intensity of color to engage the visiting work forces on a daily basis. 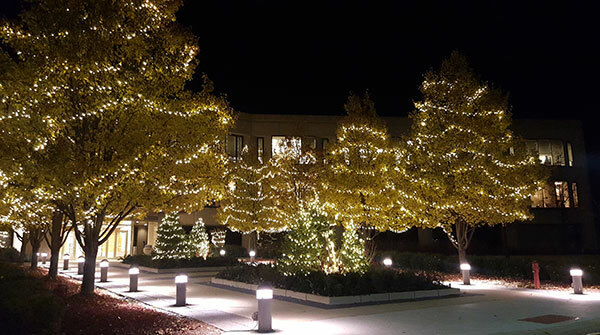 The property management team is an integral partner with the management crews to continually improve and inspire each season’s displays, to provide new and unique results, different from previous installations. As with the change to annual plantings each season, the perennial landscape elements continue to add seasonal color and texture interest, which is evident with the ornamental grass plantings in full fall color. 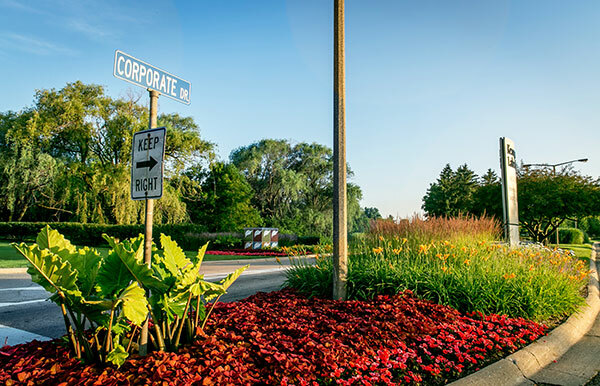 The many challenges and opportunities of this large corporate landscape are met daily by our management crews, allowing the creativity of color and texture to show their best with a background of green, healthy landscape character. A mix of seasonal color plantings combined with perennial landscape elements continue to show a variable layering of color transition throughout the full year. 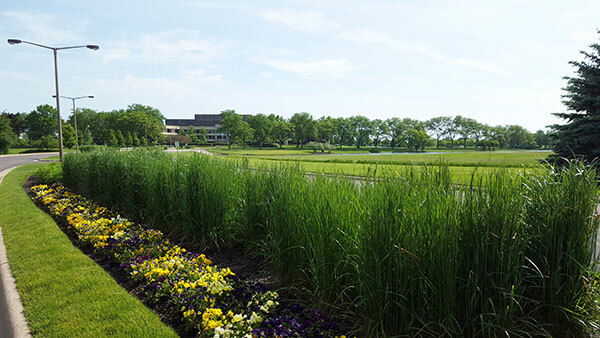 With attention to detail and proper horticultural standards, the operations teams manage the Kemper Lakes Business Center as a regionally important landscape environment.